The Board of Directors of the Crawford Fund are pleased to announce that Dr Colin Chartres has been appointed to succeed Dr Denis Blight as Chief Executive Officer as from July 1st, 2017. Dr Chartres is currently Director of Training and Master Classes at the Fund. 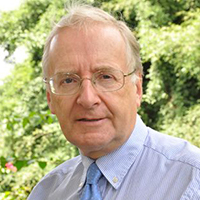 Colin has had a long and successful career in the private sector, academia and government roles. Before joining the Fund in 2014 he was Director General of the International Water Management Institute (IWMI), a CGIAR Research Centre, headquartered in Colombo, Sri Lanka from 2007-2012. Previously, he was Chief Science Adviser to the National Water Commission, and held senior management roles in the Bureau of Rural Sciences and Geoscience Australia. He worked with CSIRO Division of Soils from 1984- 1997 where he focused inter alia on soil acidity, soil structure and salinity issues and their impacts on agriculture and from 2002-2004 in the Land and Water Division, where he was involved in business development and international science linkages. The Fund will announce our new Director of Training and Master Classes later in June. Dr Blight will take leave from 30 June up unto his formal retirement from the Fund on 14 July.